I’m a guitar player. If you think about it, the sonic differences between, say a Taylor acoustic and a $79 student guitar are largely due to resonance. The Taylor is specifically designed to enhance the resonance of frequencies pleasing to most human ears. As audio pros, much of what we do is either conquering nasty resonances or trying to provide the illusion of pleasing resonances where none exist naturally. Before the advent of amplified sound, the resonance of a room such as an opera house or cathedral was a big part of how people — including composers — expected music to sound. Today, at the opposite end of the scale are newer-built multi-purpose venues that are often designed to have very little resonance at all. And we’ve used technology of systems such as L-Acoustics’ L-ISA and the Meyer Constellation to create a sort of substitution for natural resonance. This brings us to Sensaphonics’ D2 Dual Dynamic in-ear monitors. The name says a lot. 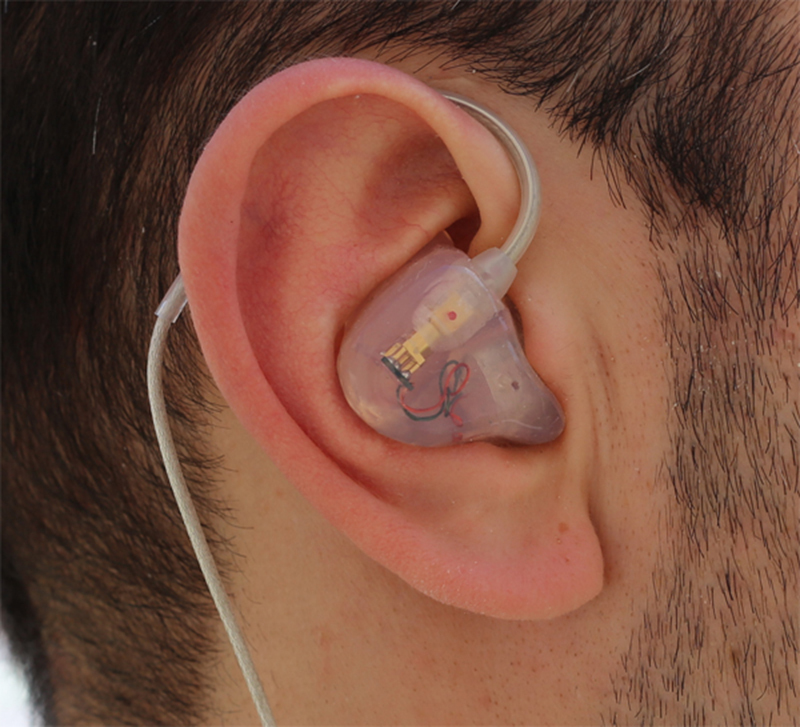 The drivers are dynamic (basically miniature speakers) as opposed to vibrating armatures that are older hearing aid technology used in many pro-level earpieces. And “Dual” tells us that there are two drivers. Sensaphonics is probably best known for its 3D Active Ambient systems, which were patented in 2012. This combination of earphones and belt pack mixer amp has tiny mics built into each earpiece, and those feed the belt pack as kind of aux input via a specialized connector. By blending the audio feed to the belt pack from the monitor console with the sound of the built-in mics, users can not only hear ambient sounds (bandmates not on a mic, audience, etc.) but also maintain a sense of directionality of sound sources on a stage. I tried a set of these about a decade ago and they were expensive, but great. Getting custom-fit IEMs means a trip to an audiologist or ear/nose/throat doc to have impressions made. It’s a process I’ve never found pleasant, especially as IEM makers keep going ever-deeper into the ear canal in an effort to create the greatest possible degree of isolation from ambient sound. For the unfamiliar, once your ears are cleaned, the audiologist or tech then shoves a small wad of cotton or gauze attached to a string deep into the ear canal. Once the wad is in place, a two-part epoxy paste is injected into the ear canal, and that sets in five to 10 minutes. The resulting blob is sent to the IEM maker. What was different this time? Instead of the block of foam that’s often used to bite down on and keep the jaw — and therefore the ear canal — as open as possible, Sensaphonics wanted a more real-life scenario. Being a performer as well as an audio pro, I was asked to bring a guitar, strap it on, stand and actually sing while the epoxy set. This different approach to impressions is an effort to create a really great seal in all of the positions performers may find themselves in while doing a show. 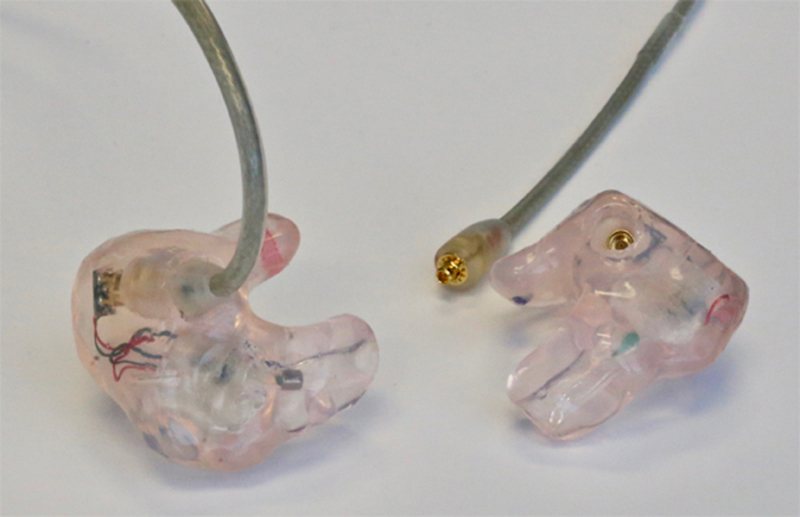 And unlike most pro-level IEMs that are made of a hard acrylic, the D2s use a medical-grade soft silicone. The D2s ability to “flex” as the jaw moves is said to make the seal far more consistent. This also makes the D2s very comfortable, even after long listening periods. About 10 days after shipping the impressions to Sensaphonics in Chicago, I received the finished D2s. The package included a shirt clip, 1/8” to 1/4” TRS adapter, cleaning tool, zippered storage pouch and a compact Pelican carry case. I began checking them out by plugging into my Mac’s headphone jack and calling up a playlist. That output usually feeds an old Sony receiver and two JBL bookshelf speakers, and the same output level I use with that setup was really loud with the D2s. They sounded really good and had buckets of bass, but intense testing would come with my band’s next rehearsal. We rehearse in a pretty small room, and there are five open vocal mics. The most effective way to tame the feedback monster is to set up everyone on headphones or IEMs and have no active loudspeakers in the room. I had been using the armature-based IEMs that have been in my gig bag for about eight years. I connected the D2s instead. The first thing I noticed was the isolation. The D2s are spec’d to provide up to 45 dB of isolation. The isolation was much greater than the acrylic models — and I had to bring down both the bass and kick in my mix. A lot of that improved bass is the difference between the dynamic drivers and the armatures, which tend to boost the midrange associated with human speech. I’ve used both, and know the difference. Listening on my phone the next day, the first thing I had to do with the D2s was turn off the EQ curve (which was set to the “Rock” preset) and set the output to Flat. The low-end requires no hyping. In both the cases of band sessions and the yard work, I wore the D2s for an average of three hours with zero fatigue or discomfort. So we’ve come a long way to talk about what’s actually inside. With two drivers, I expected a very tiny version of a two-way P.A. cabinet with an onboard passive crossover. I was wrong. Each driver is full range and identical to the other one. The drivers work in parallel, and there is no crossover. The drivers were chosen to be fairly neutral. The extra bass is a combination of the generally better low-end output of a dynamic driver plus the secret sauce. Each driver is encapsulated in what Sensaphonics calls a Dynamic Resonance Chamber. Think of them as tiny, time-aligned opera houses in your ear hole. Matched drivers and no crossover means that the phase smearing and crossover distortion that is common with many two-way designs is not an issue. In this case, two drivers means more “oomph” without the drivers working super hard. In other words, it’s about headroom. Based on having dynamic drivers, I expected the D2s to have great bass response. The real surprise was the smooth and totally natural sound of the high-mids and upper frequencies. Like many of us who’ve spent a long time in front of a P.A. system or onstage in the cymbal zone of death, my hearing is compromised. For my IEM mix, I generally find myself having to hype everything above about 8 kHz. And I have the high-hat cranked up so high that most people would find it really uncomfortable. Using the D2s, my mix flattened out a lot. Next, I did as close to A/B testing as possible using recorded music and several other transducers. It’s always hard to do this kind of testing with IEMs because it’s pretty close to impossible to switch between them immediately. There is going to be a bit of time in between each test just in putting on and taking off headsets. And that delay can color the perceptions of sound differences. With this in mind, I picked a variety of sources. First up was a set of mid-priced semi-pro, over-ear headphones, in the sub-$150 range. The D2s played louder and actually had more bass and an overall more natural sound. Next up was my personal favorite set of on-ear headphones. With the exception of some increased resonant depth in these Heil Pro Set 3s (largely a perception thing that results from more airspace between the driver and the eardrum, plus the bone vibration) — the D2s stacked up nicely. And there is no way I could wear those on-ears for three hours without discomfort. Finally, I tried the armature-based IEMs I’ve been using. Keep in mind that when these came out, they were noted for their increased bass response and warmth and I reviewed them very positively. Same program volume and EQ settings as the D2s. As soon as the music started, I winced and tore them off. Compared to the D2s, the sound was so thin and piercing in the upper-mids that it was actually painful. I like the D2s a lot. Remember I mentioned that the other Sensaphonics buds I had used were really great but also very expensive? Well, the D2s clock in at a reasonable $550. The D2s are not the only choice for dynamic, custom-fit IEMs. But I’m not aware of another custom dynamic option that’s not three times the price. And the soft silicone material, coupled with the best seal possible, a pair of drivers with tons of headroom and that resonance secret sauce make the D2s the first thing I reach for when I have to shove speakers into my head. The D2 Series is the world’s first multi-driver dynamic IEM with custom-fit soft silicone earpieces. As their name suggests, the drivers are dynamic – basically, miniature speakers – and “dual” refers to their two drivers. The D2s perform on par with other dynamic, custom-fit IEMs at a very competitive price. I can’t use them when swimming laps. Bill Evans is an independent engineer and writer based in Las Vegas.